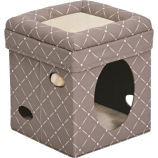 The four-tier Deluxe scratching cat tree Condo has a number of platforms for sitting and resting, encouraging your pet to play, climb, scratch and sleep in the hanging hiding places. 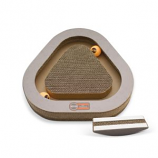 The condo is extremely stable and durable, keeping your pet safe. The condo offers multiple sisal rope posts that help to make the scratching experience for your cat more enjoyable. It also has a soft reversible machine-washable cushion which is grey on one side and Beige on the other side. Assembled dimensions: 22.4” L x 24” W x 62.2” H. All Dimensions are approximate and colors may differ slightly. 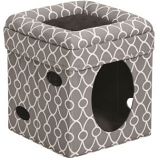 The Three-Tier Deluxe Scratching Cat Tree Condo has a number of platforms for sitting and resting, encouraging your pet to play, climb, scratch and sleep in the hanging hiding places. 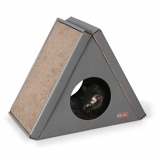 The condo is extremely stable and durable, keeping your pet safe. 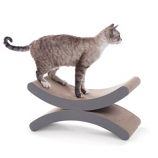 The condo offers multiple sisal rope posts that help to make the scratching experience for your cat more enjoyable. It also has a soft reversible machine-washable cushion which is grey on one side and beige on the other side. Assembled Dimensions: 22.4” L x 27.1” W x 45.7” H. All dimensions are approximate and colors may differ slightly. 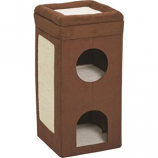 The two-tier Deluxe scratching cat tree Condo has a number of platforms for sitting and resting, encouraging your pet to play, climb, scratch and sleep in the hanging hiding places. 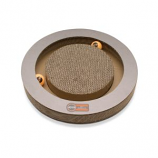 The condo is extremely stable and durable, keeping your pet safe. The condo offers multiple sisal rope posts that help to make the scratching experience for your cat more enjoyable. It also has a soft reversible machine-washable cushion which is grey on one side and Beige on the other side. Assembled dimensions: 22.4” L x 22.8” W x 33.5” H. All Dimensions are approximate and colors may differ slightly. Cats can lay on it take a nap or use it to stretch and scratch. 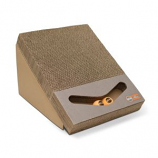 Two curved carboard pieces attached at the middle make up this innovative scratcher. Catnip included. . . Extra interactive fun is packed into this perfect rolling toy. A cutout middle track makes the balls visible to kitty as they roll back and forth with ease. The outside scratching surface appeals to a cat's natural instinct to scratch and claw. 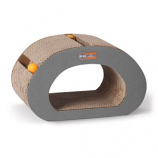 Catnip included. .
Ramp is designed to satisfy their need to stretch and scratch while the orange roller balls will keep them entertained as the. The brush can be used to groom their body and face. Catnip included. . . Simple assembly. 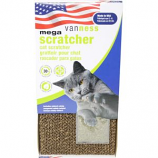 Large scratching surface will appeal to your cat's instinct and need to claw. Cats can swat and play while the two balls roll around back and forth.. Catnip included. .
A great way for a cat to scratch and play at the same time. Three roller balls will keep cats occupied while the cardboard surface entices their natural desire to scratch and claw. Catnip included. . . Your pet will be mesmerized by its round shape and built-in tippy bottom enabling it to rock back and forth while two balls r. The middle scratching surface will appeal to a cat's natural instinct and need to claw.. Catnip included. . .
Large cardboard surface area encourages appropriate scratching and natural clawing instincts. Comes with two optional Tippy rockers that can be installed on the back to help toy teeter back and forth during use. Two balls roll around for extra interactive fun. Catnip included. .
Cats can swat and play while the two balls roll around back and forth.. Catnip included. . . . Helps protect your furniture. Satisfies the need to scratch. Naturally irresistable. Natural catnip included. Made in USA. Comes with an optionalTippy rocker that can be installed on the back of the toy. 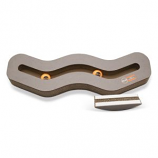 Allows the toy to teeter back and forth while the two balls roll around for endless interactive fun. 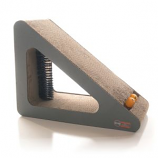 The middle scratching surface will appeal to a cat's natural instinct and need to claw.. Catnip included. . 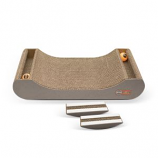 The twin carboard scratchers offer upright ramp-style scratching to let cats stretch while scratching. Scratchers are removable. Catnip included. . .